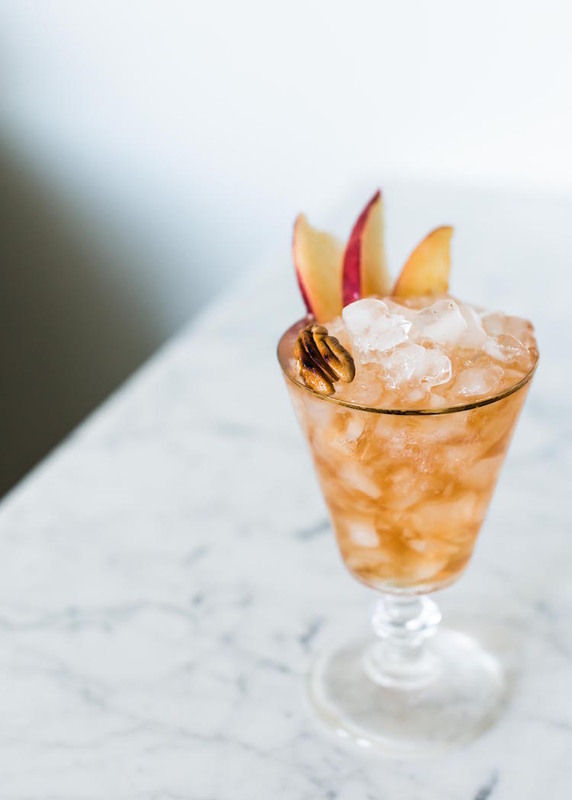 A bitter sweet yet refreshing tipple to enjoy in the long golden rays of summer, the Bitter Pecan Peach Dandy will be your go-to summer sipper to drink until the last peaches are replaced by pumpkins. 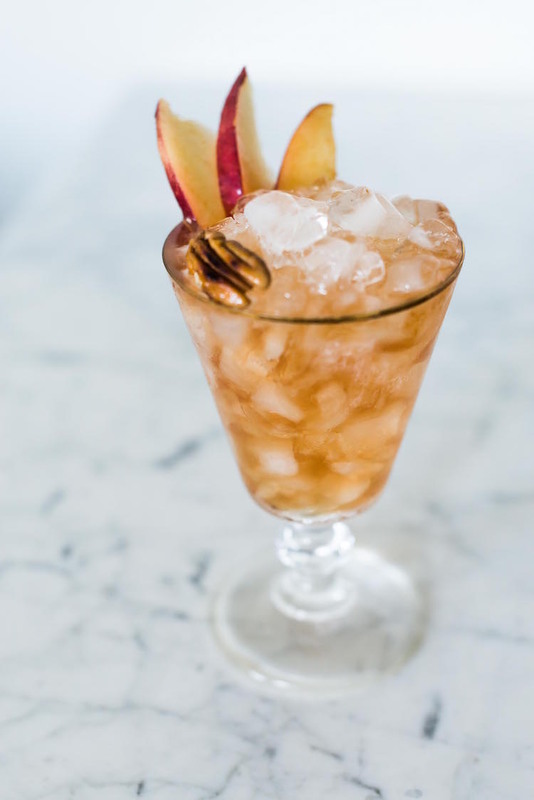 The amaro peach cocktail has a base of rum with a heavy hand of Amaro Sfumato, toasted pecan orgeat and of course juicy peaches. If you are all Amaro what-a-what-now, no fear, I am hear to walk you through a bit about this amazing and complex style of spirits. 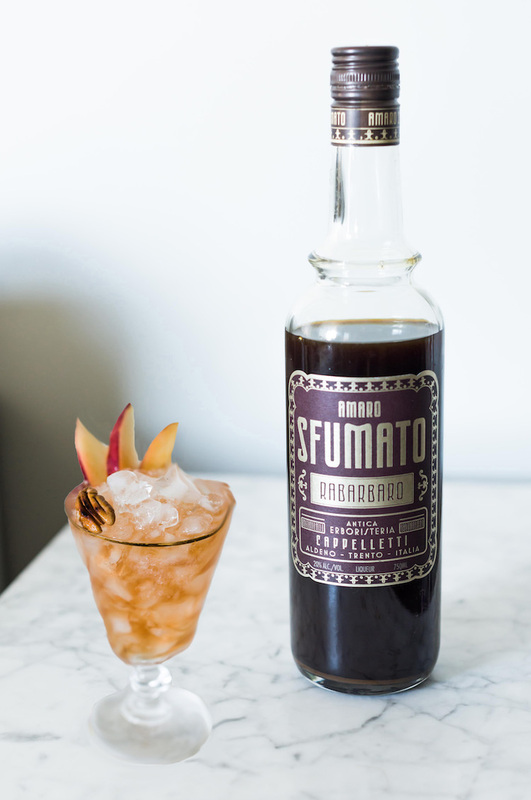 Sooo let’s back up, what is an Amaro exactly? Amari have been around a long time, despite what some may think with it’s well deserved current “trendy” spot in the spirits world. In fact, it has never gone out of style in Italy, it is a life style there. They are often drank straight post meal to aid indigestion thanks to the bitter herbs and spices used in the recipes. My friend Josh of Inua Kena wrote some really great pieces on Amari (the plural for Amaro) years ago. 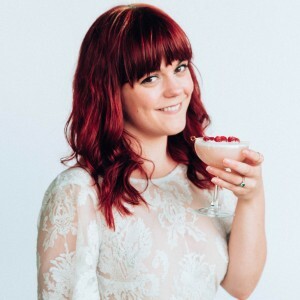 This is just a brief explanation of these bitter beloved spirits. And Amari are just that, bitter spirits (meaning bitter in Italian) often hailing from Italy. Although distilleries outside of Italy are making bittered, herbal spirits left and right to fill the feverish demand for all things bitter. 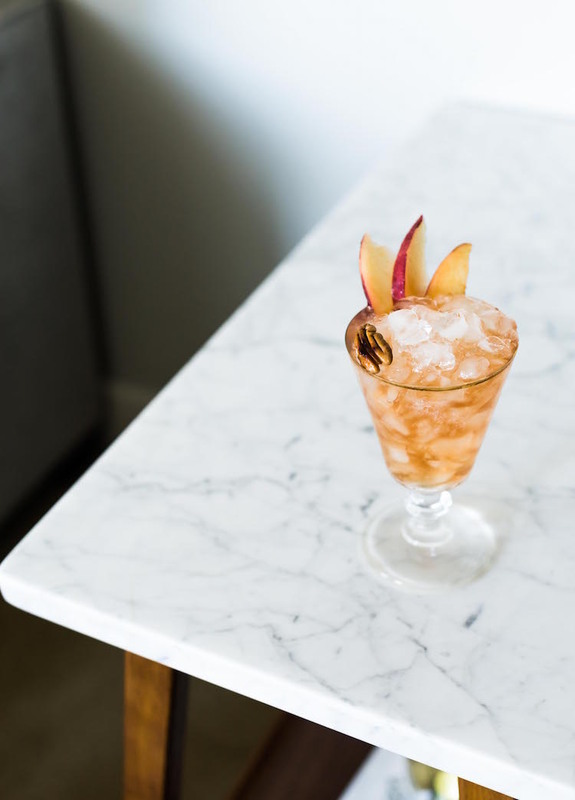 You are probably familiar with Campari and/or Aperol, these have been the most popular Amaro available. The explosion of interest in Amaro is partly (entirely?) due to the Negroni and Negroni variations. 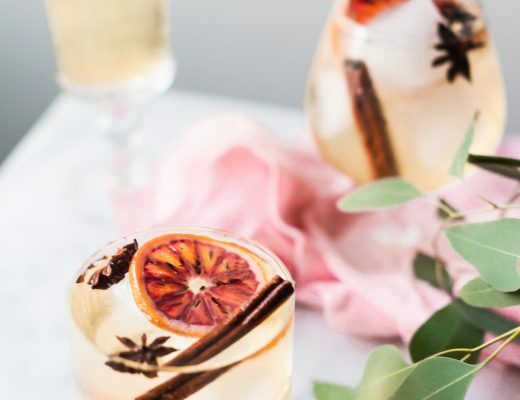 Although there are many (and growing) Amari and non-Italian bitter spirits have even recently garnered themselves a designated week on Instagram. 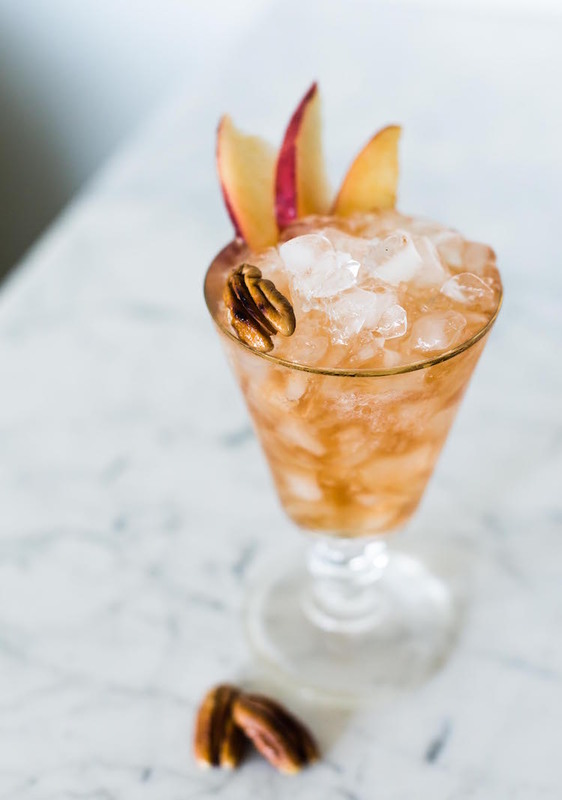 The Bitter Pecan Peach Dandy is made with a Rabarbaro Amaro called Sfumato, produced with rhubarb and alpine herbs and spices. It’s not distilled with the vegetable itself, but the earthy root. If you have ever had rhubarb, you know it’s bitter, same goes for it’s root. The name of the spirit is derived from fumo, meaning smoke. It does have a slightly smoke ting to the flavor that goes well with the toasted pecan orgeat. 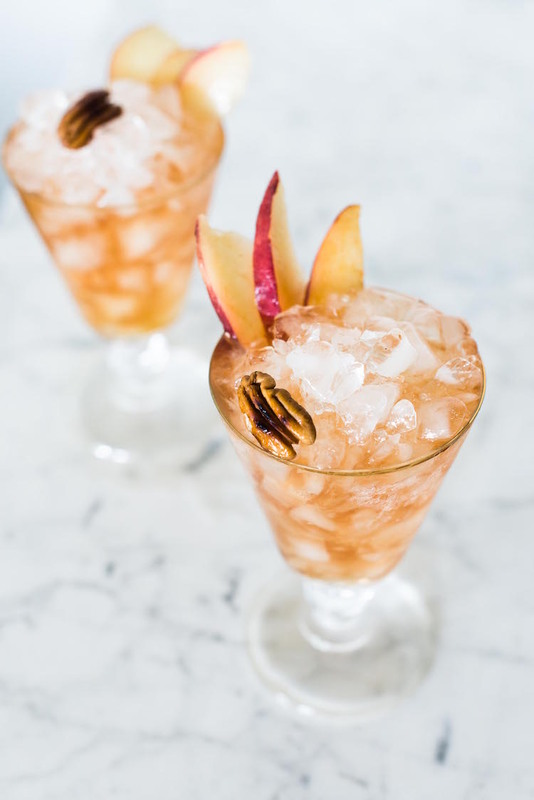 Paired with spicy, complex rum and juicy peach, this Bitter Pecan Peach Dandy amaro peach cocktail is one satisfying sipper! Toast pecans for syrup, reserving a few for garnishing. Makes pecan orgeat and let cool before using. Muddle peaches in shaker cup. Add the rest of the liquid ingredients. 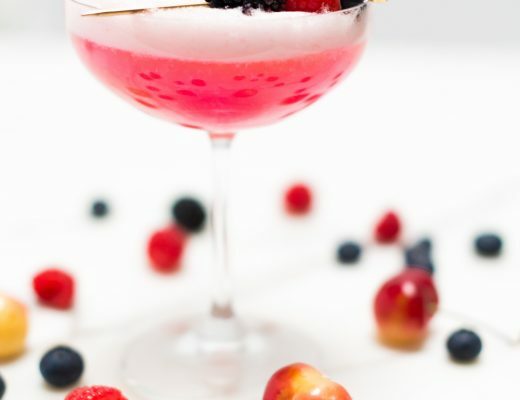 Shake with ice and strain into a fluted glass or highball with crushed ice. Add more ice to dome on top of glass. 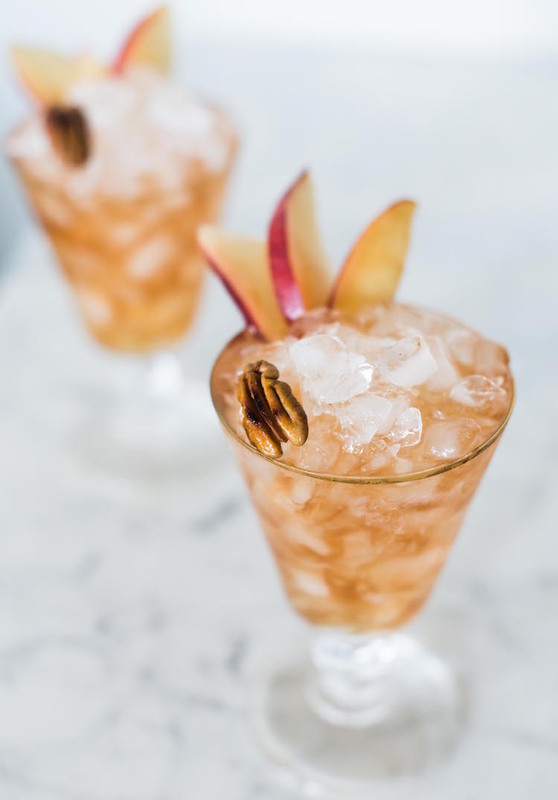 Garnish with pecan and fanned peach slices. Toast pecans at 400°F for 4-5 minutes. 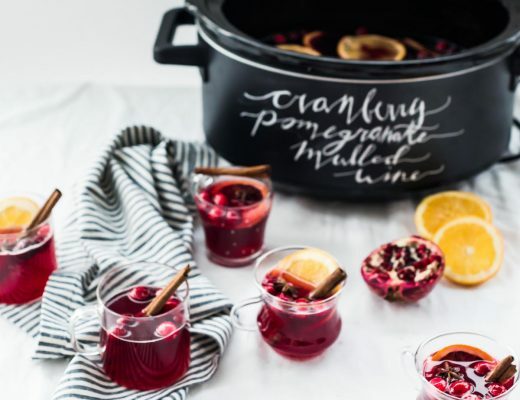 Let cool and then add to a blender and blend into fine pieces. In a saucepan, heat the sugar and water on medium heat until the sugar dissolves and the mixture starts to boil. Add pecans and simmer on low heat until mixture is about to boil again, remove from heat and cover. Let set in the fridge over night or 8 hours. Strain steeped mixture through three layers of cheesecloth or nut milk bag into a bowl, squeezing the cloth as you go. Add orange flower water and stir. Add to a jar or bottle and keep for two weeks in the fridge. 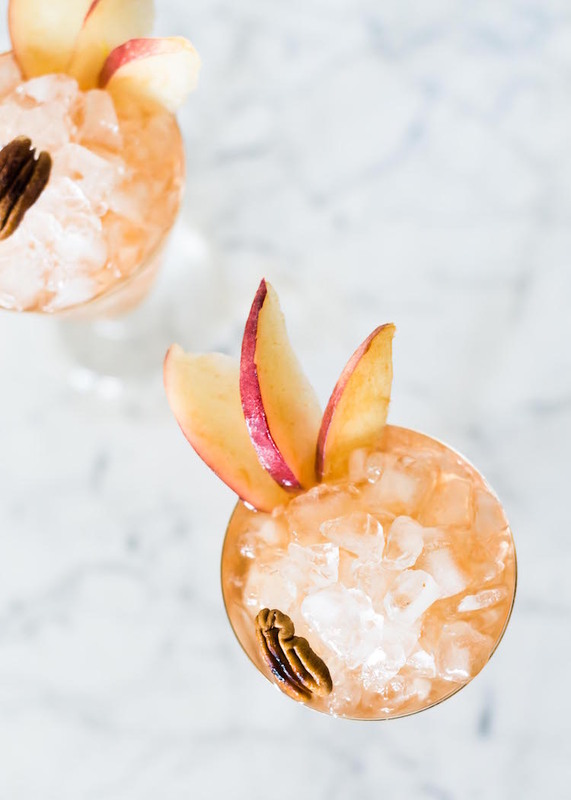 Pecans in a cocktail! You must be from the southern united states? This cocktail sounds great. We may have to try something similar in our bar in Calgary! I lived in Florida for a few years, how did you guess?! haha I love peaches and pecans in a pie together, i figured I’d try them in a glass together.